STANDING IN APPROXIMATELY 11 ACRES IN A BEAUTIFUL LOCATION AND SET WELL BACK FROM THE ROAD DOWN ITS OWN LONG DRIVEWAY. SANDS FARM IS LOCATED BETWEEN THE VILLAGES OF NETHERTHONG AND WILSHAW AND HAS A DETACHED LARGE BARN, TRIPLE GARAGE AND FABULOUS ACCOMMODATION. 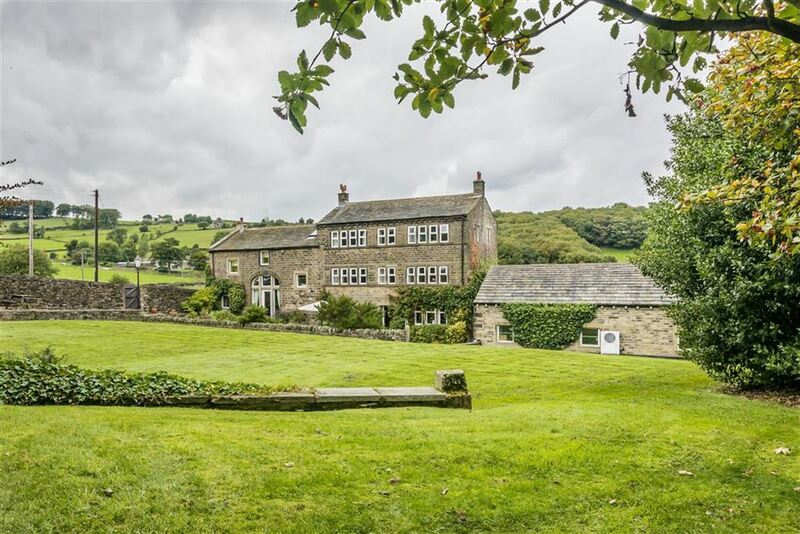 Including five double bedrooms, farmhouse dining kitchen, huge lounge, family room / den are very much worthy of mention here. All will please those that view. 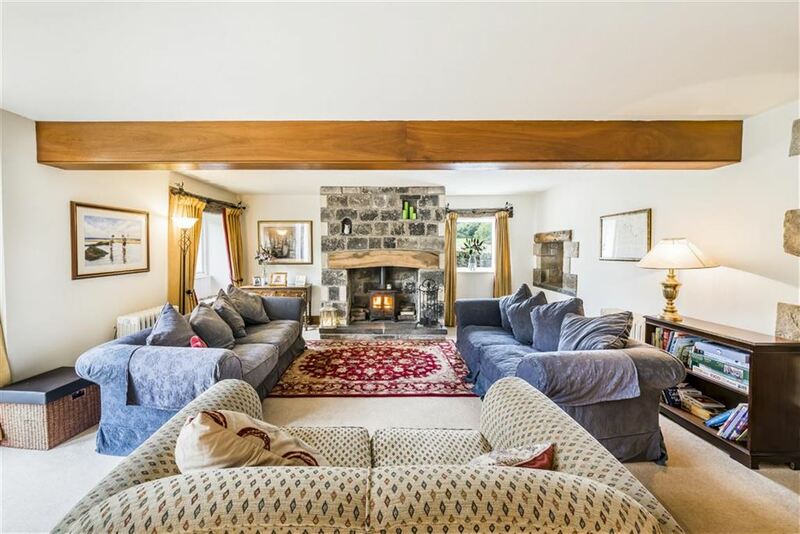 This beautifully balanced home has been renovated over the years and now offers a delightful blend of location, land, outbuildings and space. 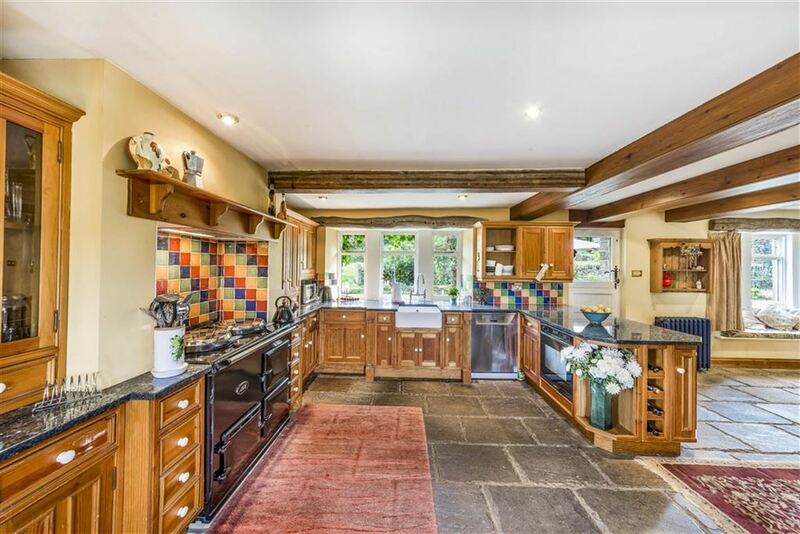 For those who require a lovely joining of a characterful barn and a super three storey cottage that all make one large family home. Viewing is essential. A timber and glazed door gives access through to an entrance lobby. 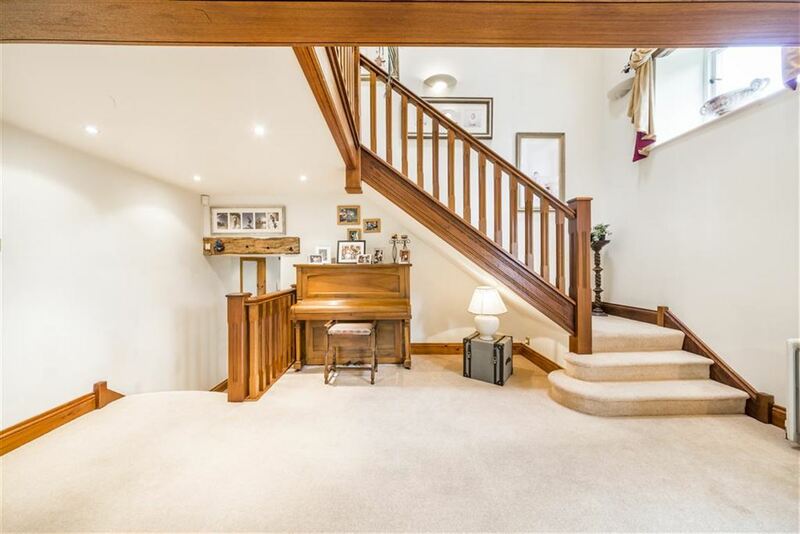 This entrance lobby has a stone flagged floor and a period style door gives access to a downstairs w.c. A further period door leads through to the fabulous farmhouse living/dining kitchen. 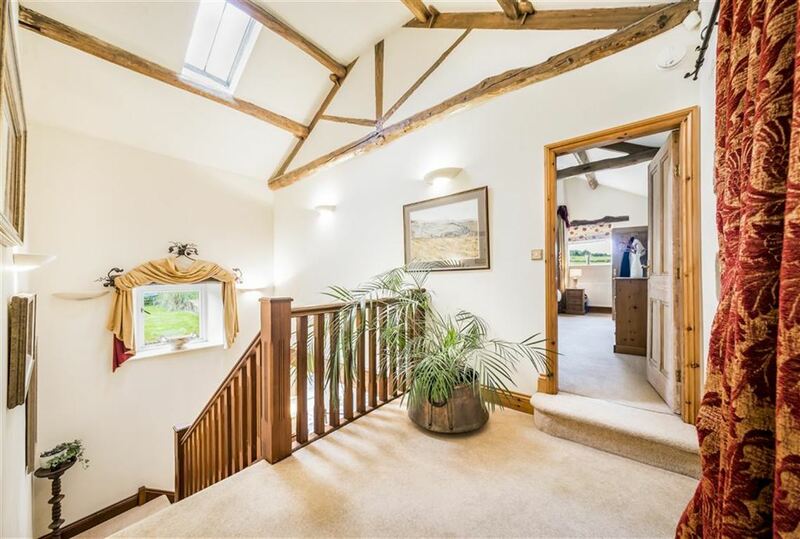 This as the photos and floor plan suggest is of a particular good size and has a superb flagged floor, beams and timbers on display and windows to three sides providing fabulous views out over the properties gardens, driveway and land. With inset spotlighting, the whole room is presented to a particular high standard and has a sitting/family area to one corner with a beautiful arched top window. The kitchen units themselves are to be found to the high and low level and have a large amount of granite work surfaces. There is an inset Belfast sink with stylish mixer taps over. Aga with the usual warming hot plates in chrome and being of a two oven design being powered by electric. There is an integrated Smeg oven and an integrated dishwasher. A door way gives access to a pantry/cellar head. The cellar is of a particular good size and offers a great deal of potential if desired. 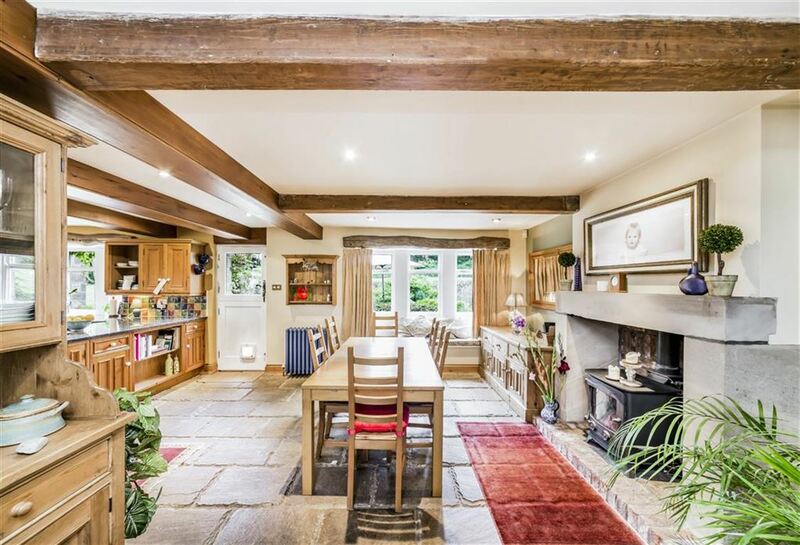 The dining area is as the photos suggest is presented to a high standard and as previously mentioned has beams and inset spotlighting to the ceiling. There is a delightful stone fireplace with a raised antique brick hearth and back cloth and all is home for an oil fired cast iron stove with glazed door. The mullion windows overlooking the gardens are particular pleasing and has a window seat beneath. There are also period style central heating radiators. This once again is a fabulous room of huge proportions and is beautifully presented. 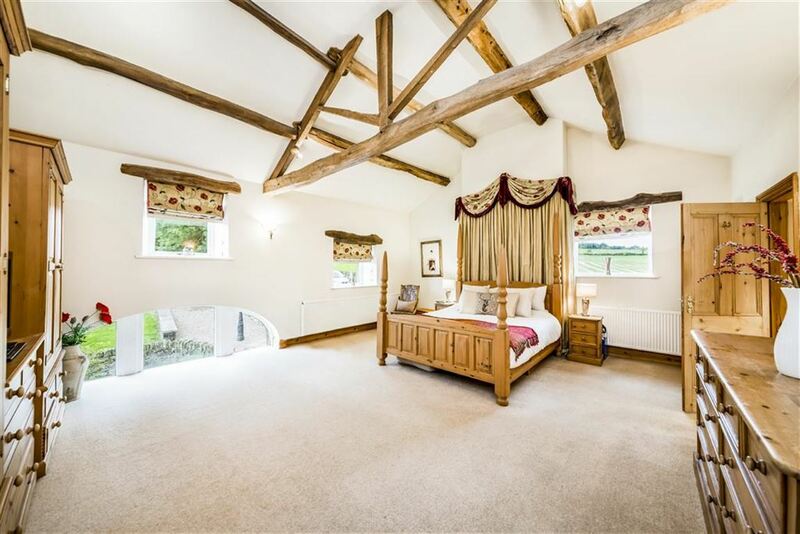 This highly characterful room has lovely views out over the properties gardens and super views out over the properties fields and rural views beyond. Once again with period style central heating radiators, inset spotlighting to the ceiling. The room features a beautiful stone chimney breast reaching up to the full ceiling height. 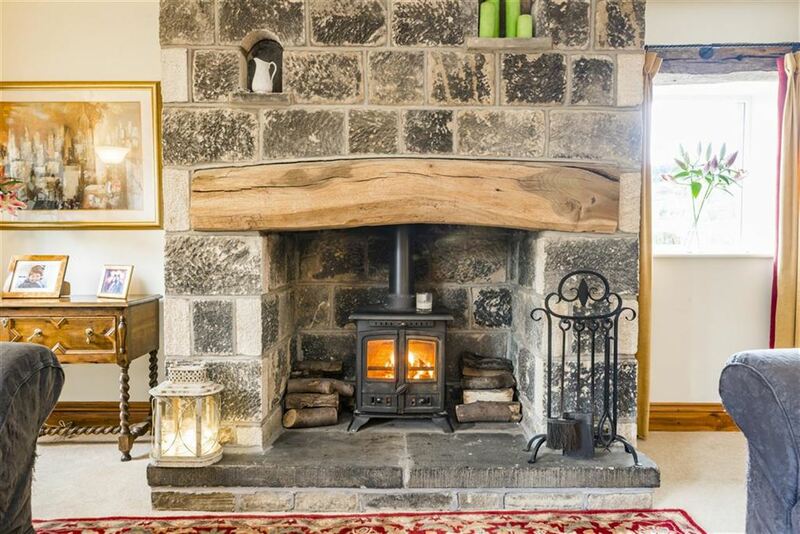 With fabulous stone flagged hearth and all being home for a glazed fronted, solid fuel burning cast iron stove. 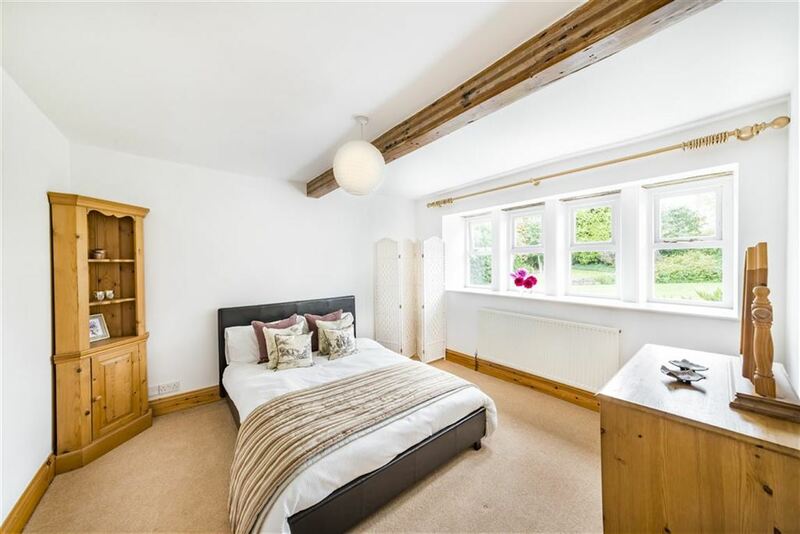 With windows overlooking the gardens and in actual fact part of the former stone arch, the upper proportion being in the bedroom above, these provide a huge amount of natural light. 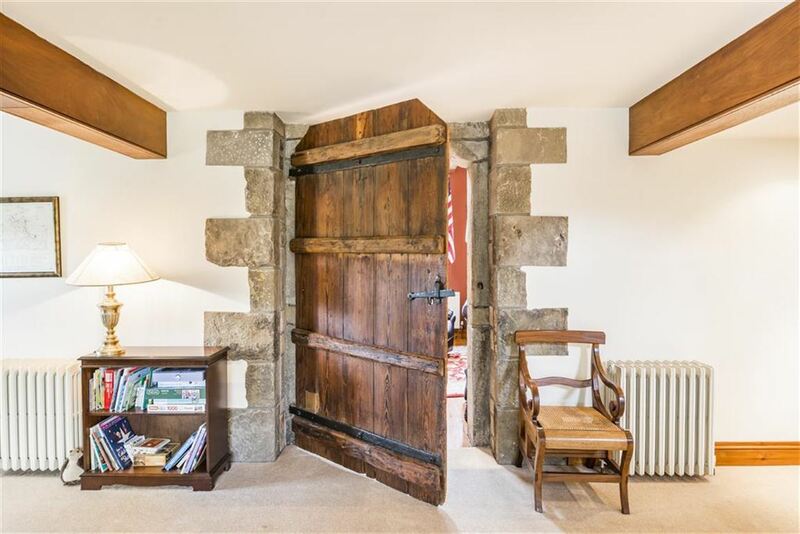 A fabulous, exceptionally broad original style timber braced door with iron furniture with a stone archway leads through together to the family room. 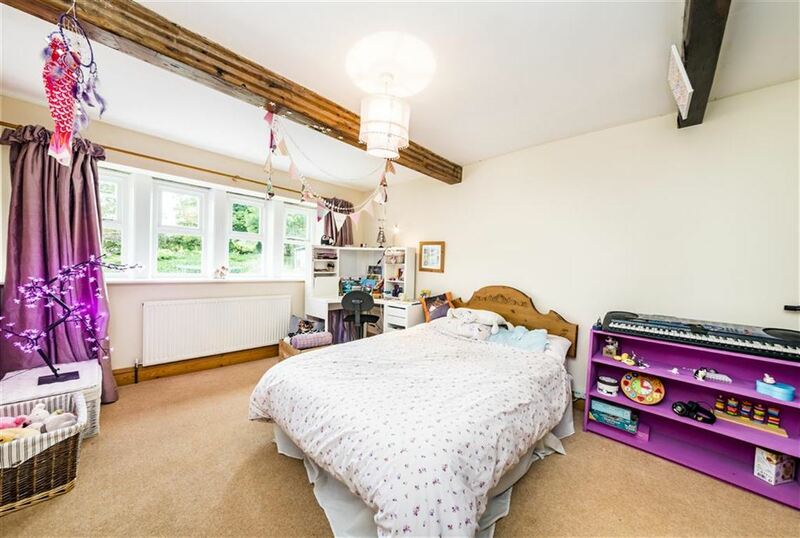 This with lower den/play area to one side is again a magnificent room overlooked from the first floor landing via a minstrel style gallery. The room has a high angled and beamed ceiling line with exposed stonework, multiple windows at differing levels all providing a great deal of interest and style. 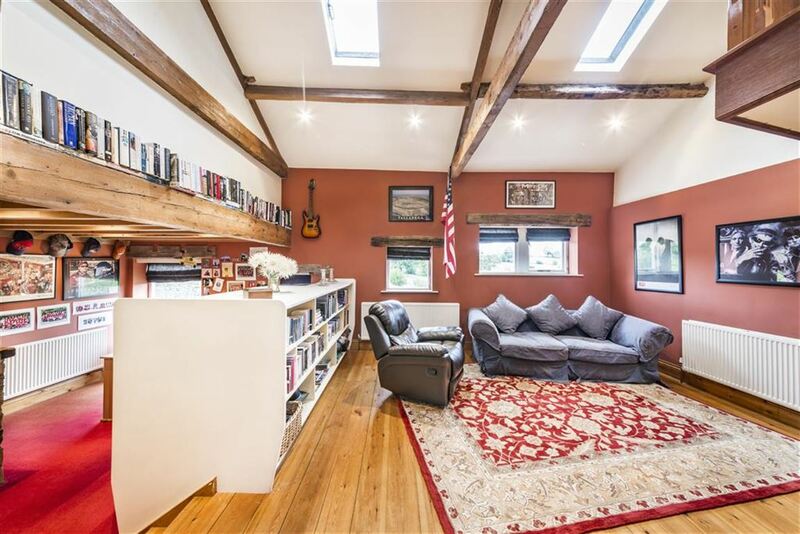 The family room area has a beautifully polished timber bordered floor and library style book shelving with display plinth over. 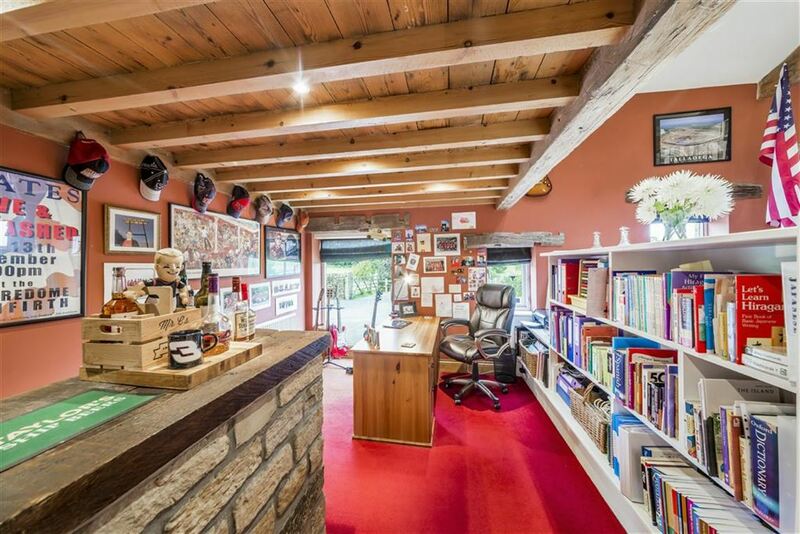 This continues to the den side where there is a home office area and bar. The room has inset spotlighting to the ceiling and two velux style windows. Off the entrance lobby there is a good size utility room being well equipped, having a large amount of working surfaces with stainless steel sink unit. Plumbing for an automatic washing machine, space for a dryer, cupboards to the high and low level and home for the properties boiler. Stone flagged flooring, cloaks/hanging area and windows giving a super view. A staircase of particular high quality rises up the partial galleried first floor landing and taking in full advantage of the high and angled beamed ceiling line. 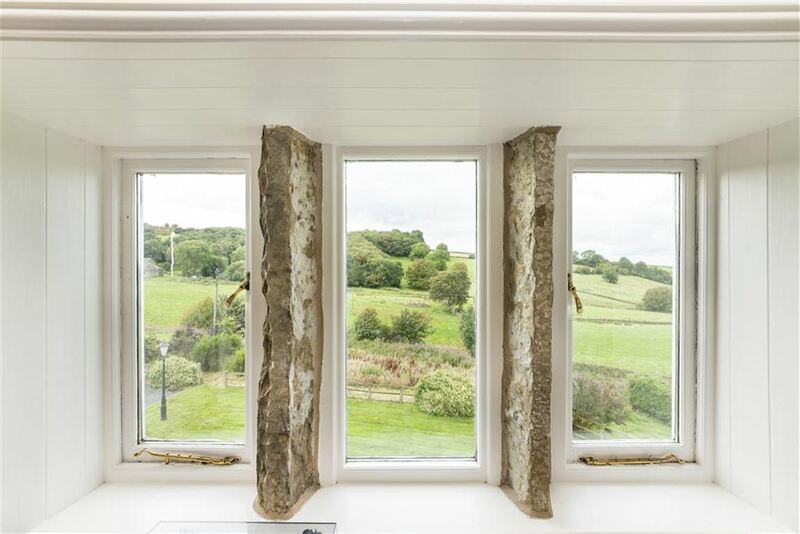 Feature window giving a pleasant view out over the properties front gardens and velux window. 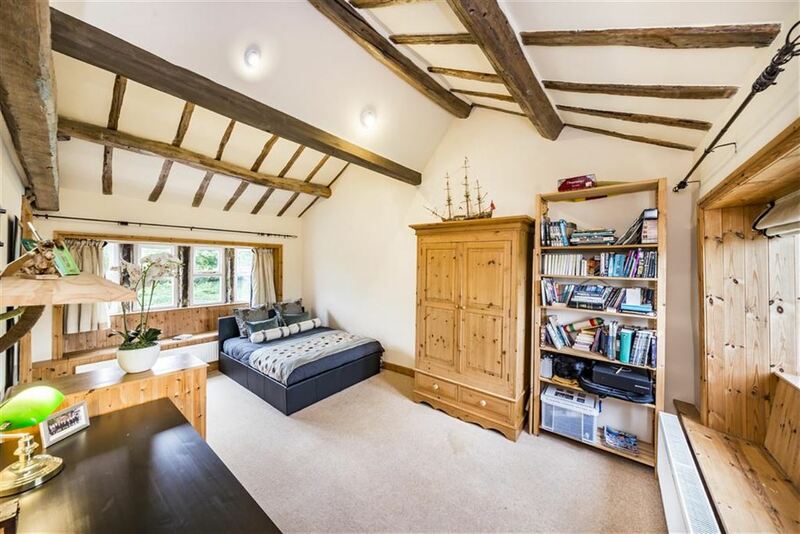 An enormous double room with beautiful beams and timbers to the high angled ceiling. There is the upper portion of the barn arch providing three glazed panels with a further window above giving a super view out over the gardens. 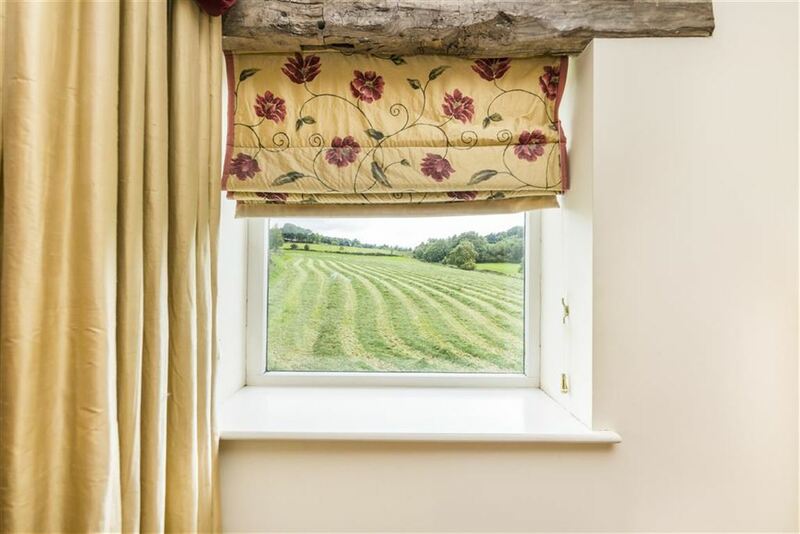 A further window giving a pleasant view out over the gardens And a gable window giving a super view out over one of the properties fields and view up the valley. 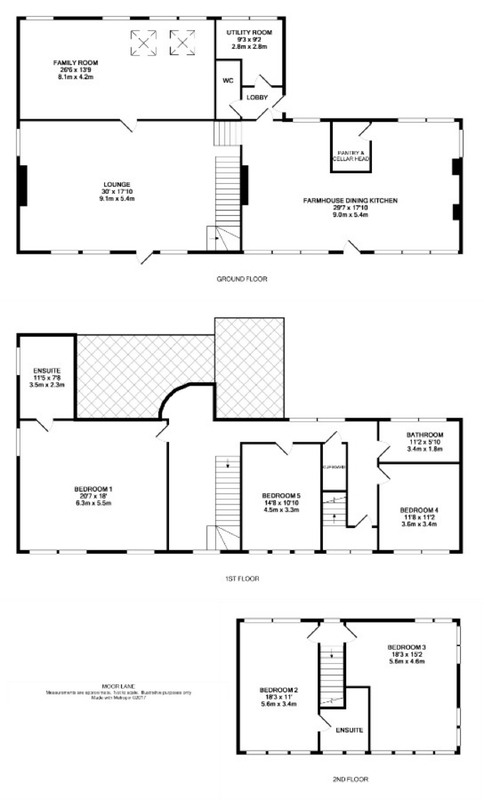 Fitted to a high standard with a three piece suite in white which comprises of a low level w.c, pedestal wash hand basin, double ended bath and large shower cubicle with chrome fittings and an American style shower head. Beamed ceiling with inset spotlighting, tiling were appropriate and extractor fan. The first floor landing continues and passes a window giving a super view out over the properties fields and beyond. There is an under stairs storage cupboard and a doorway gives access to a lobby area with mullion windows giving a view out onto the properties front gardens. A further staircase continues up to the top floor level with window giving a super view, beams on display and inset spotlighting. A beautiful double room with fabulous views to both the front and rear, with window seats to both windows. High angled and beamed ceiling once again with inset spotlighting. Finished to a stylish nature with twin wash hand basins, good sized shower cubicle with American style shower head, low level w.c, combination central heating radiator / heated towel rail. Further central heating radiator and mullion windows giving a super view out over the properties gardens. 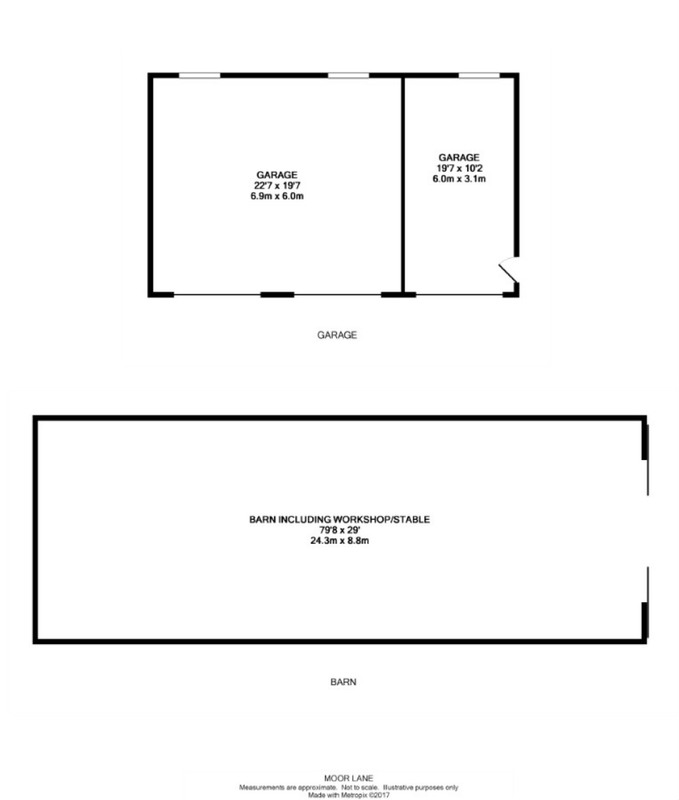 An astonishing room which could be considered suitable as a further sitting room due to the fact that there is a beautiful high angled and beamed ceiling. Windows to three sides giving tremendous views out over the properties own land, neighbouring land and the valley scene beyond. The windows are quite incredible, there is a total of eleven mullioned windows all of which have window seats beneath. There is a fireplace for decorative purposes at this time being of cast iron and to a period design. Often used as a guest bedroom, this lovely double room has a bank of four mullion windows giving an outlook over the properties gardens. There is a central ceiling light point and beam on display. This being closest to the bedroom to the principle bedroom has a bank of mullion windows overlooking the properties gardens and is once again of a double size. It has two beams exposed to the ceiling. 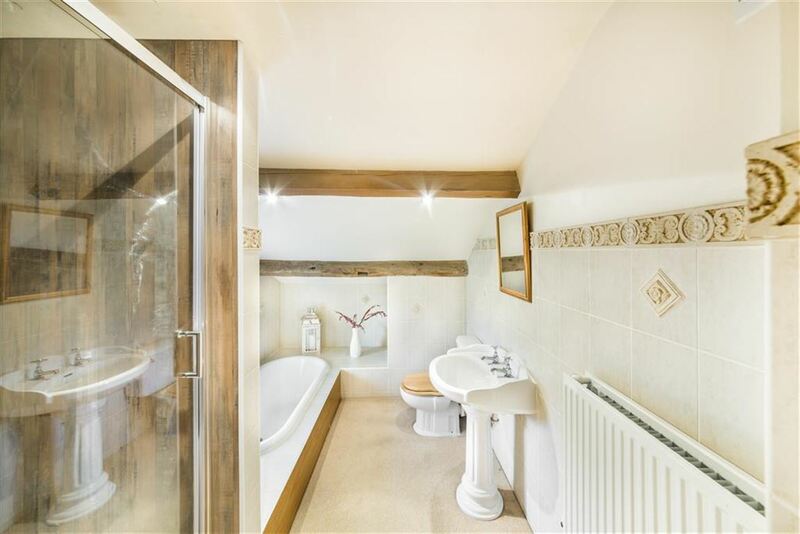 The properties bathroom is fitted with a four piece suite in white and comprises of a good sized bath, pedestal wash hand basin, low level w.c and shower cubicle. There is appropriate decorative tiling, beam on display. Inset spotlighting and windows giving a super view. Standing well back from the road and enjoying a beautiful valley location, surrounded by fields with mature trees and having a view down the valley towards the village of Netherthong. 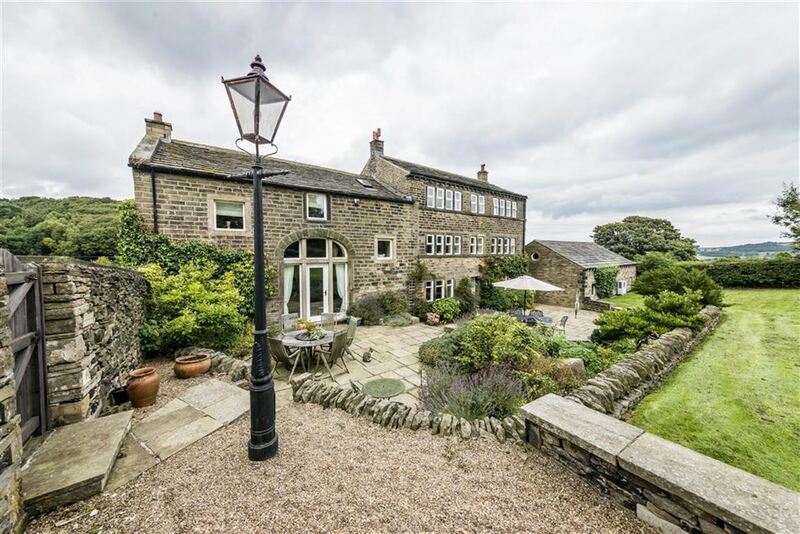 This farm can only be described as beautifully located, approached over an exceptionally long driveway with impressive entrance area and gates. 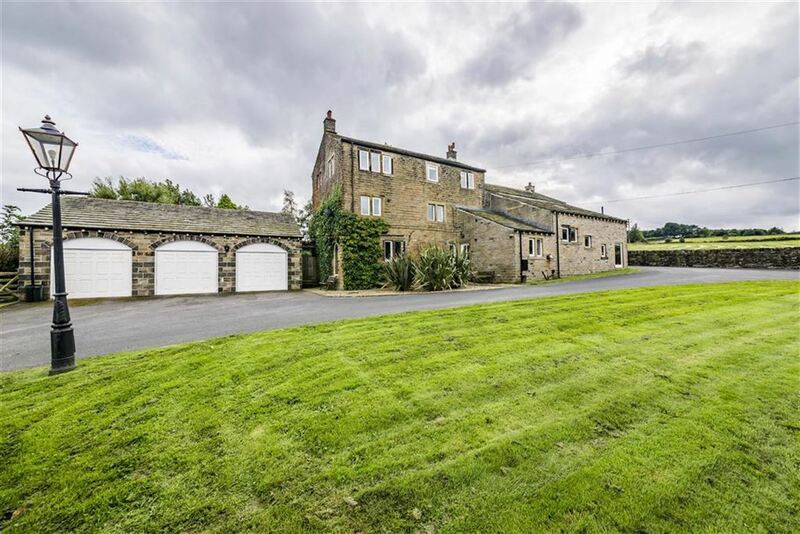 The farm is positioned someway down its own private driveway and this driveway gives access to the fields and detached barn, together with the triple garage block. Standing in approximately 11 acres the home enjoys its own land from virtually every window. With a detached modern style barn, virtually 80ft by 29ft with twinned timber sliding doors, workshop and stable within and concreted floor. Much flexibility exists at Sands Farm, whether this be for equestrian, sheep, cattle and the like. 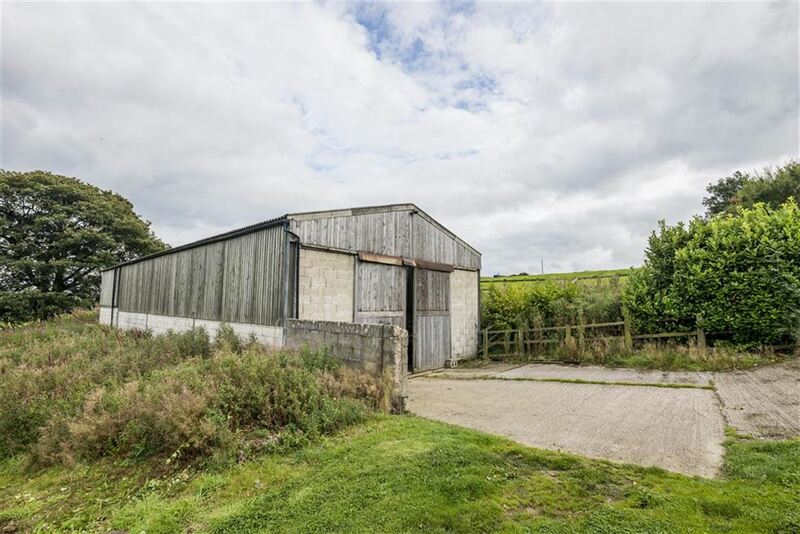 Indeed the barn was originally built for the housing of cattle, there is a good amount of land adjoining the barn providing useful yard space and there is a concreted forecourt area before it. The two large fields are of high quality being gently sloping and with well-established boundaries and all are accessed internally. 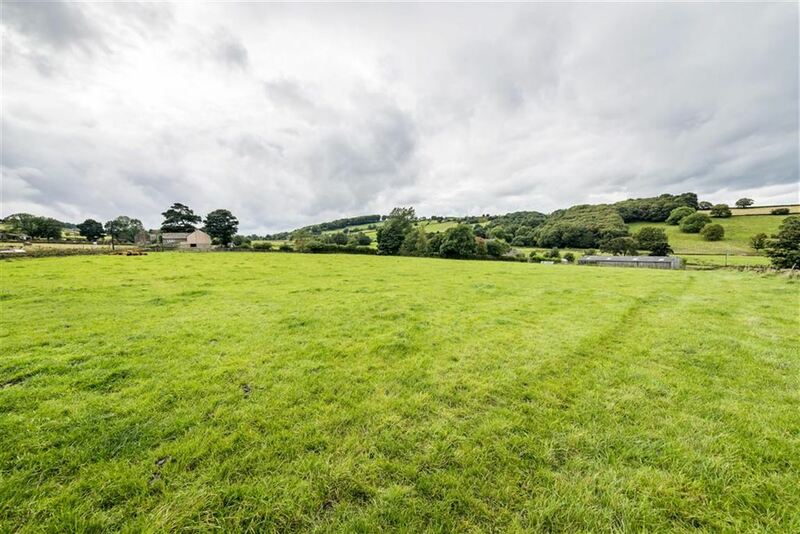 The driveway and the field have a public footpath over part of them and there is a lovely walk from here up and down the valley and into the local woods with Honley village being a short walk over the hillside. In other words the footpath provides one with idyllic walks into the countryside directly from this home. The property has a detached triple garage block, this comprises of a single garage and double garage, all with automatically operated up and over doors. The single garage is ideal for that special motorcar or indeed the usual household equipment and is also home for the properties boiler/accumulator. See separate heading for heating. 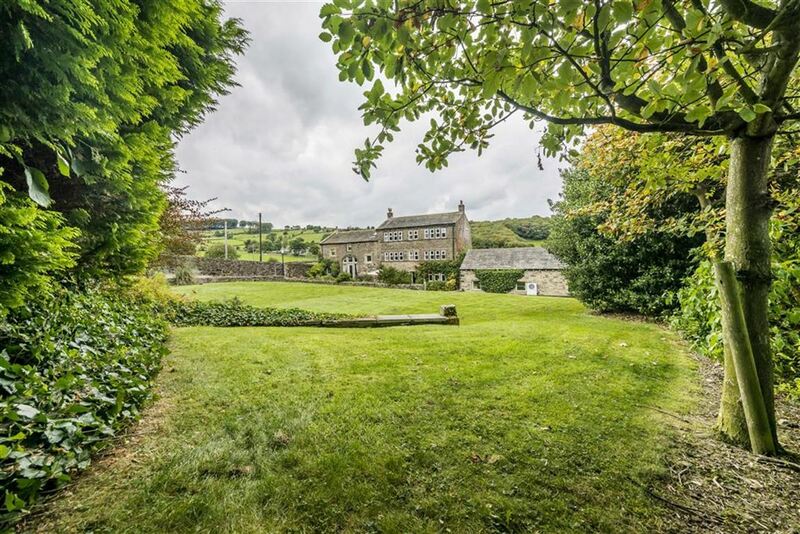 Facing southerly direction and being exceptionally private with high stone walling and mature shrubbery and trees the garden enjoys a sheltered location. Immediately to the front of the home there is a full width stone flagged patio / sitting out area with a further stone flagged area to one side. 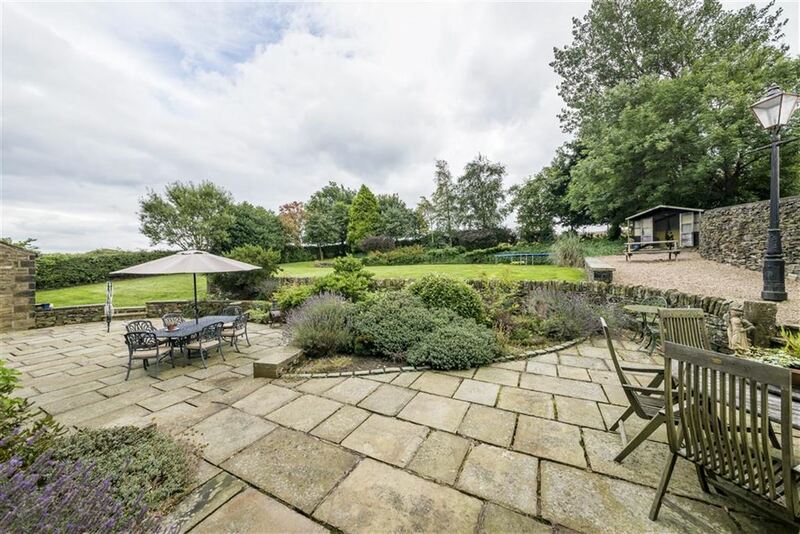 There is a large shaped lawn with mature shrubbery and trees, delightful flowering beds, summerhouse enjoying a view of the principle faced of the home and the long distance views beyond with Thurstonland Church and Emley moor mast in the distance. 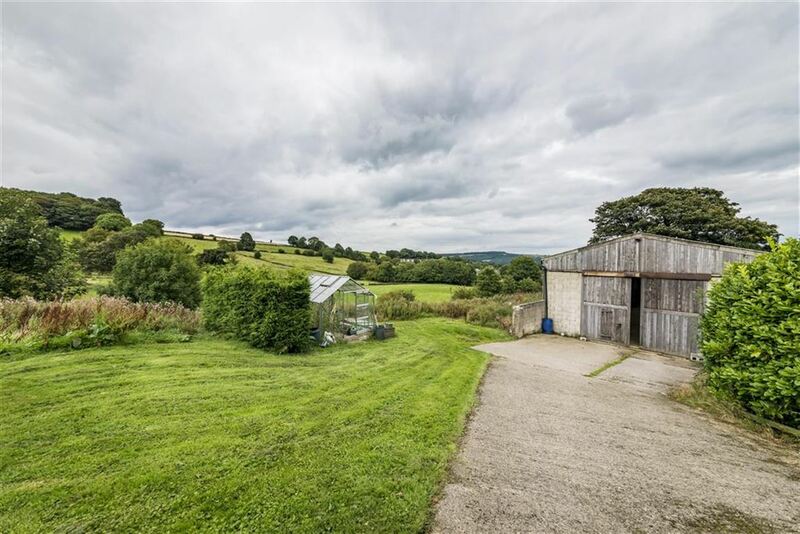 It should be noted that the property has been well equipped over the years with a very high specification and easily controllable multi fuel system. This includes an air source heat pump, oil fired central heating and solar panels. All of these three elements add energy to the accumulator tank which provides domestic hot water and central heating power throughout the home. 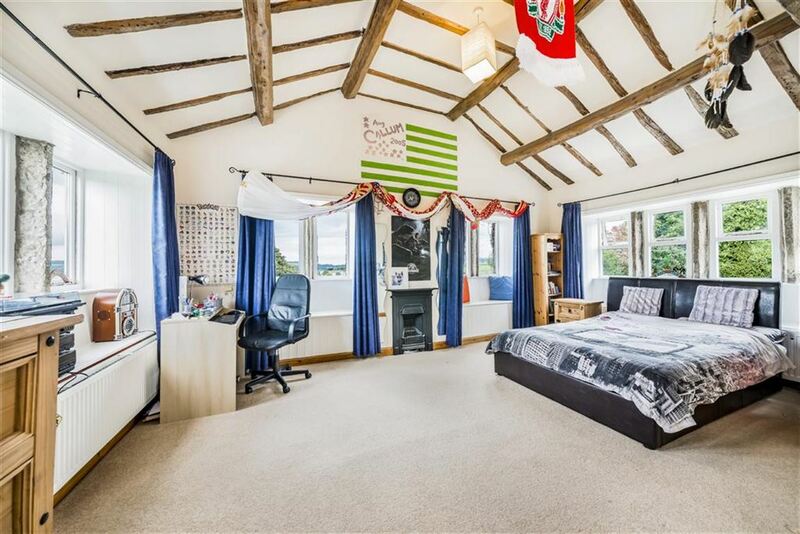 It should be noted that the property has double glazing, alarm system, carpets, curtains and certain other extras may be available by separate negotiation.